Congratulations to the Reach for the Sky Rink All Stars on winning FIRST PLACE at the Great Neck ISI Competition on Sunday, December 7, 2014 with their new holiday hit, "Nobody Cares About Santa Claus." The All Stars, Sky Rink's longest running ensemble team for the past 7 years, are the 2014 and 2013 Showcase National medalists and are coached by staff professional, Marni Halasa. Great job Catherine, Emma, Gaby, Victoria, Jean-Li, Tiffany and Alida, skaters who are part of our Sky Rink's elite prep programming and morning freestyles. Be sure to watch for more All Stars performances this month, including the Riverbank Holiday Show on Saturday, December 13 at 4pm and Sky Rink's Holiday on the Hudson Skating Show on Friday, December 19 at 6pm. Sky Rink's longest running artistic ensemble team, "Reach for the Sky Rink All Stars" are leaving in less than a week for the 2014 USFS Showcase Nationals in Los Angeles at the Pickwick Ice Arena, August 8th through the 10th. 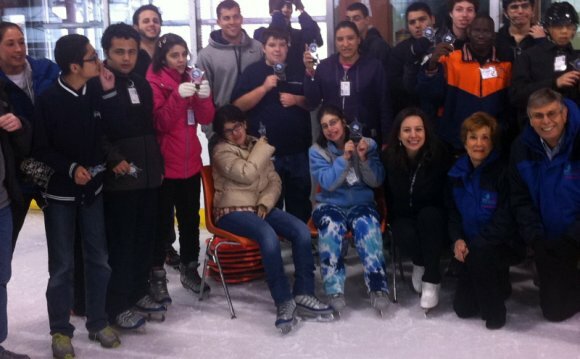 The team, based at Sky Rink, is comprised of 15 members of the Skating Club of New York. The girls qualified last February with a second place finish at the SCNY's Competition in Theatrical Showcase last February with a comedic version of Chicago's Cell Block Tango. Coached by Sky Rink staff professional Marni Halasa, the team won a bronze medal at last year's National Showcase Competition in Cape Cod in the Production Team category, and is looking forward to this year's competition in Los Angeles. "It's not just that we have elevated the team's skating numbers with fantastic props, spectacular theatrics and unique choreography, the girls have a real chemistry together, and are sisters on and off ice the ice, " said Halasa. "You can't replace that and it shows when they skate together." Please join us in wishing them luck at this weekend’s competition! Congratulations to all of the Sky Rink coaches and skaters who competed at the 2014 Adult National Championships in Hyannis, Massachusetts last weekend! Coaches who had students in the competition include Denise Beaumont, Ken Benson, Darlene Parent, James Schilling, Maria O'Connor, Emanuel Ancorini, Keith Lichtman, Elisa Angeli and Brad Cox. Kudos to all! The US Figure Skating competition is designed to accomodate the hundreds of adult skaters nationally who desire to continue their competitive experiences, at all and any levels, from beginning levels like Pre-Bronze to Masters categores was a huge success. Sky Rink's longest running artistic ensemble team, "Reach for the Sky Rink All Stars" qualified for the 2014 USFS Showcase Nationals. The Showcase in a unique competition opportunity where figure skaters can perform artistic and creative routines as a single, duet, small group or production. Coached by Sky Rink staff professional Marni Halasa, the team won a bronze medal at last year's National Showcase Competition in Cape Cod in the Production Team category and looks forward to this year's competition in Los Angeles.